In need of something charming, simple and modest in size for your indoors or out, then the Monet A-Grade Teak Outdoor Coffee Table is ideal! 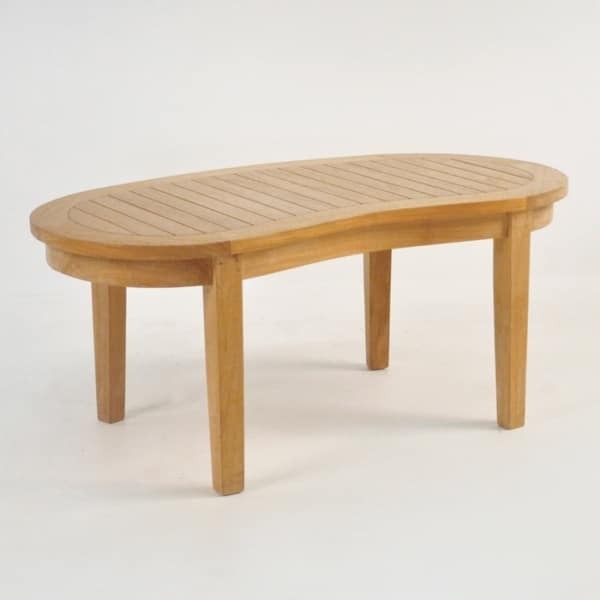 A wonderful curved shape that is primarily designed to fit in with the fabulous Monet collection of A-Grade Teak outdoor furniture, the fantastic Monet A-Grade Teak Outdoor Coffee Table sits at 47 by 25 inches curved outward on one side and inward on the other, giving it a unique flavor like no other table! 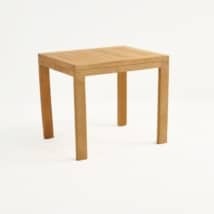 A stable base with tightly placed slatting creates a secure item you will love! The Monet A-Grade Teak Outdoor Coffee Table is constructed out of – you guessed it – A-Grade Teak! W25" x L47" x H20"
Renowned and celebrated for its strength, durability and beauty, this wonderful wood comes from plantations in Indonesia, and is given the high grade ‘A’ only if it is the premium heartwood of the teak timber. We use timber that is cut when the tree has reached prime age and stature, assuring that the levels of rubber and oil coursing throughout the teak is high, resulting in an overall beautiful effect with an incredible long life. A-Grade is the best quality wood for outdoors you can buy – the proof is in the product and in our customers feedback and reviews! Enjoy the solidity and quality assurance we offer in these luxury products. 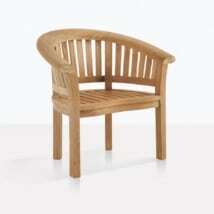 At Teak Warehouse we know about teak, but also specialize in other materials ideal for outdoor use. Explore the wonders of All Weather Wicker, now available from Teak Warehouse in 3 great brands: Viro ®, Ecolene® and Rehau® – all through dyed and UV treated fabrics that enable you to make the most of your outdoors with various seating, relaxing and dining options available to you. We also have a great new range of mesh fabrics – marine worthy – look at exquisite Batyline® or Textilene® fabrics for a gorgeous and comfortable option for your loungers and dining chairs. If that weren’t enough, we also carry a dining and accessories range of Raw Concrete – adding industrial style luxury to your home and garden! #316 Stainless Steel and powder coated aluminium is present across our range of furniture. At Teak Warehouse, we know how to turn your dreams for outdoor furniture into a reality! 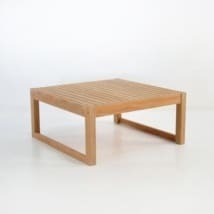 The Monet A-Grade Teak Outdoor Coffee Table is a wonderful choice alongside the Monet Collection. 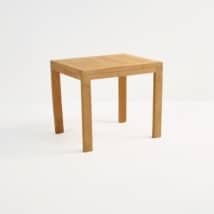 Pair up with the matching bench and chairs for a minimalistic seating unit in your garden or patio setting. Bolster your seating with a few fun throw cushions and relax in the tranquility of your surroundings. 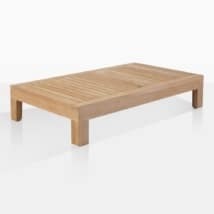 Our Monet A-Grade Teak Outdoor Coffee Table is also a wonderful choice for indoors – bring this charming, cute table into your living room setting for a touch of mid-century attitude for your interiors. We love this adorable table in a relaxing setting with 3 or 4 of our cushy Relaxing Chairs in one of wicker varieties, creating a warm and welcoming setting you will love chilling out in! The Monet A-Grade Teak Outdoor Coffee Table is a luxury piece of outdoor furniture from Teak Warehouse. Call us now to see how this gorgeous table can take precedence in your collection!